As Nancy Drew, track the history of Mike Malone, a notorious gangster who once lived in a lakeside cabin. Trail a mysterious pack of dogs rumored to have risen from the dead to protect their master`s secrets. Decipher cryptic puzzles and dodge danger in this immersive Adventure mystery. You`ll meet a variety of fascinating characters, all with something to hide. 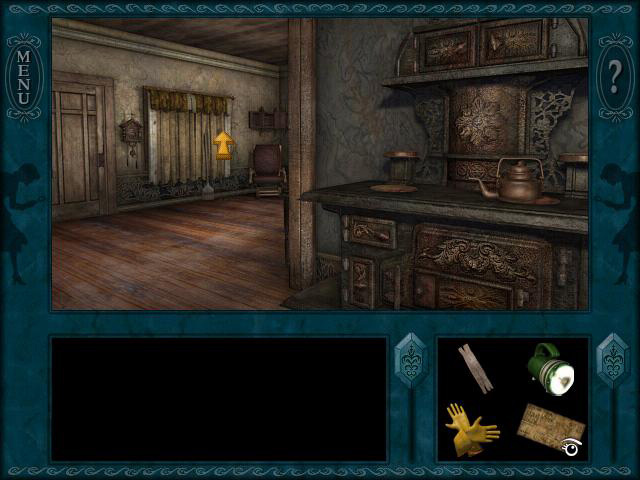 Can you unravel the secrets and expose the truth in Nancy Drew: Ghost Dogs of Moon Lake? 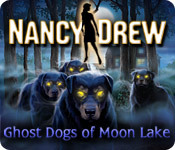 Nancy Drew: Ghost Dogs of Moon Lake is rated 4.3 out of 5 by 18. Rated 5 out of 5 by TraeTrae from Awesome I really like this game. It has a spooky quality to it in some parts and the storyline is great. I may not have mentioned this in any of my other Nancy Drew reviews but I really appreciate the fact that the team that made this game series went through the trouble to add some facts to the games and incorporated them into the game in many ways. Rated 5 out of 5 by Polisuco from A wonderful adventure game. Has it all! "Nancy Drew: Ghost Dogs of Moon Lake" was definitely a great game and a nice improvement over "Message in a Haunted Mansion"! Now you can move from one place to another much more easily since there are arrow cursors pointing in the directions you can go. Yay! The storyline was amazing and very interesting. 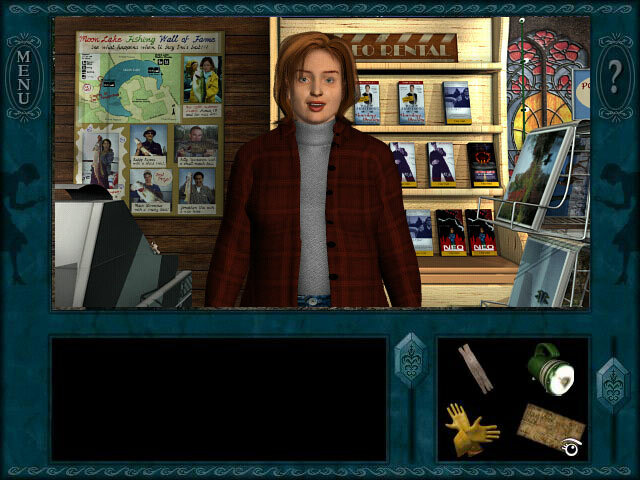 So far, this was the easiest Nancy Drew adventure game I have played, but it still provides lots of challenges, and some of them can still "bug" you... A very memorable game, no doubt about it. Nancy stays the night at a creepy, small, old house in Moon Lake, but she is disturbed by a spooky apparition of dogs roaming the woods and trying to enter in the house. Could these be really the previous owner's dead dogs? Or someone in the small laketown is hiding something? Pros: - The gameplay is very intuitive and the actions you are supposed to do are always very obvious and that's a great feat. I always knew what to do next! ; - The graphics are great! The rundown look adds atmosphere to the game and it works beautifully; - Great storyline. I loved reading every bit concerning it. Malone's story is very mysterious and very well told. I loved visiting the speakeasy! ; - Great and interesting characters. You actually feel that each has a mind of their own. That is only possible due to the great voice-overs and the script; - As I mentioned before, the arrow cursor addition is very, very helpful and a must. It made my gaming experience much better and way more pleasant; - Nice puzzles, totally solvable. Malone's dogs surely will take a lot of your time and atention! ; - This game has a vibrating atmosphere. The sound effects and the beautiful music all add up to it. I really immersed myself in the amazing environment that the developers created. Pure magic; No cons at all! This was an amazing gaming experience and adventure. Very complete, nothing was missing! This time in Moon Lake was definitely an unforgettable one for me. I sincerely hope you'll love and appreciate the game as much as I did! Dive in this mystery concerning the Prohibition era and ties that remain even when all is said and done and I'm sure you won't be disappointed! Rated 5 out of 5 by Brooke_Lyn from What a Nice Surprise! Loved This Game!!!! This is the 7th game in the series, the first game I ever played was Alibi In Ashes and I was hooked! Since then I've played some newer but decided to go back and play the older games from #3 up in no particular order! Having just finished Ghost Dogs I'd give it 10 stars if I could! Excellent storyline that flows perfectly!! I assumed it would be easy.. Oh no.. It’s as difficult or more than some of the newer games and as fun as some of the best! But very seldom do you need any help as in a walkthrough! Nancy does have a PDA in this game which comes in handy! Nancy goes to visit a friend Sally McDonald who bought a run down cabin on Moon Lake in Pennsylvania. Once owned by the infamous gangster-Mickey Malone- in the 1920’s! But, as with all ND games when she arrives nothing is as it should be.. Is it ever??? Upon arrival Nancy finds out Sally is gone and left a note that she couldn't stay another night! The phone rings it’s Sally, the conversation is broken up but she begs Nancy to leave, just get out of there, the Dogs, the Dogs!! Well, that only makes our young detective more curious and determined to stay and find out who or what ran Sally off her property! Plus a tree fell behind Nancy’s car when she arrived so she can’t leave.. Convenient huh? Dogs with glowing eyes and teeth attacking and rattling the house at night would scare me off too, but not Miss Drew! Of the older games this one is long and you do a lot of running around, it adds length to the game of course but It didn‘t take away from the game.. The Map for the forest is difficult to navigate and you go in the forest very often so be prepared to get lost! Luckily the forest has some landmarks so you can get your bearings! I did get lost so long twice it changed from day to night and sent me back to the cabin! You need to go into the forest so much I just started to have the turns figured out around the time the game ended.. Ha! Besides the forest you take a motor boat (you have to fix# to Em’s emporium #the store# and The Ranger Station! There are 3 characters you interact with Red Knott-The Bird Watcher.. Very enjoyable character! Emily--Owner of Em’s Emporium Jeff Akers--AKA Park Ranger Akers Phone Interactions include: Sally McDonald The Hardy Boys Bess and George Vivian Whitmore - Mickey’s former girlfriend, she’s still alive and knows a lot about Malone's house and it’s secrets. ??? All ND games are geared towards sleuthing, solving the mystery, puzzles and learning new things! I enjoyed the things you learn in this game.. To name a few: Real history about Malone via newspaper clippings from the 1920’s.. Different kinds of bird sounds and photographing them.. Bug catching I could have done without but it’s quick and easy! Since you apparently arrived without a dime to your name which I find silly as wealthy as Nancy’s Dad is that he would let Nancy go broke and all? So you have to work #do puzzles) for anything you need from Em’s and the Ranger. Read all the literature at the Ranger Station it’s very helpful in real life situations.. There is one difficult timed puzzle that gets you killed a time or two before you figure it out! And another towards the end.. The need for Second Chances are plentiful throughout this game too.. This is just an over-all fun game with everything you expect from Nancy Drew.. Including “Things that go bump in the night”… With most games I would call myself intermediate.. Nancy Drew games I'm still a beginner! Enjoy your stay at Moon Lake and beware of the Ghost Dogs!! Rated 5 out of 5 by bunnybelle9 from Wonderful I really love Nancy Drew games, and it truly was a mystery to me! I kept changing my mind about who did it. The game itself wasn't scary for me at all, yet I still had nightmares, but the game isn't frightening unless you count the dogs at night which were startling for me. Rated 5 out of 5 by Mrs_Kim from FAN-tastic! This is a classic ND game and one of its best. The setting is creepy. I first played it back in college, the CD has broken since then, and luckily BFG sells this and I quickly bought it. I love the storyline, and the dogs are actually pretty cute! If you're a mystery fan, whether or not you like Nancy Drew, you should give this game a try. Rated 5 out of 5 by WispofWist from A Fantastic Game Either I suddenly became better at figuring out how Nancy Drew games work, or what you have to do is alot more clear in Ghost Dogs over other Nancy Drew games. Although at the very beginning I found myself wandering around not sure what to do, after I did the instigating tasks what came next became quite easy to figure out. Not to the extent where the plot's predictable, but of course. I had begun to think that wandering around aimlessly was a necessary part of Nancy Drew games. Fortunately, Ghost Dogs proved me wrong. I sigh in relief. This is one of the Nancy Drew games without much of a theme, which has its good points aswell as bad. Basically, if you hate mythology, you do not have to worry about hating the game because of the reliance on mythology, but the game tends to be weakened in intensity because of this lack of a focal point for all the puzzles to revolve around. On the topic of puzzles, there is more of an adventure theme to this game than puzzles. Not that it is bare of puzzles, but they are more directly relevant to the game than they are minigames. In my opinion this is a good thing because the "puzzles" in the latest Nancy Drews bare a most peculiar resemblance to fillers. Basically, this is not the most engrossing Nancy Drew there is, but it is excellent. It has no sub plots, and is not of epic length. #Although some adventure games are# If you were lying in bed thinking about this game, it would be more of a "Hmm, that game is really interesting. I wonder what happens next?" instead of a "What just happened there was awesome! How did they even think of that? What do I do next? What happens next? Oh, who cares about sleep! I need to know who did it!" It's enjoyable and makes you look at things a different way #like all Nancy Drew games#, but it is not something with so much atmosphere you cannot stop having dreams about it. Is it the best game ever? No. Is it a fantastic game? Absolutely. 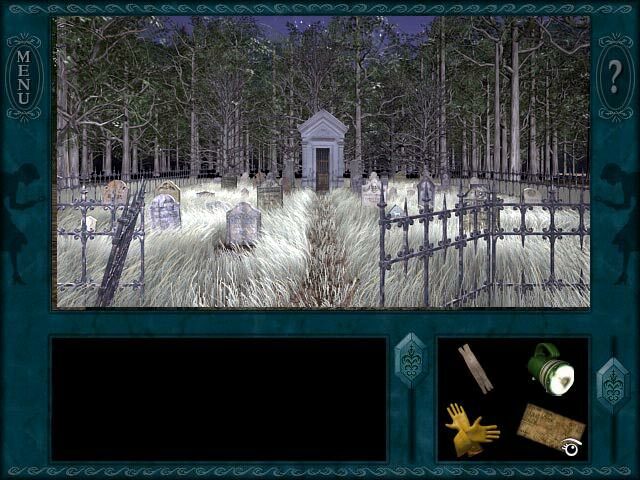 Trail a wild pack of dogs rumored to have risen from the dead in this haunting Adventure mystery game.